Bite and Booze: Vote for Bite and Booze in Draft Magazine's Annual Great Grill-Out Recipe Contest! 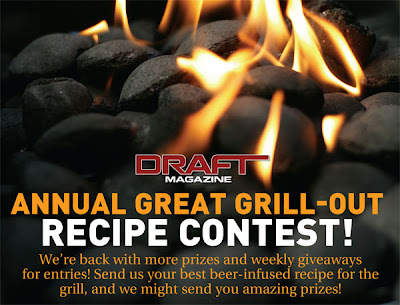 Vote for Bite and Booze in Draft Magazine's Annual Great Grill-Out Recipe Contest! Ladies and Gentlemen, I'm at it again. This year, a recipe of mine has been selected as a Top 10 finalist for Draft Magazine's Annual Great Grill-Out Recipe Contest. The theme of the contest was right up Bite and Booze's alley: "recipes are limited to 10 ingredients or less - one of them must be beer - and your dish should be made on the grill." The only pantry ingredients we were allowed to include that didn't count as our ten were salt, black pepper, and olive oil. This contest was a no-brainer for me to enter and I'm thrilled that my recipe has been chosen as a finalist. If I win, I could get another Big Green Egg Smoker/Grill Package, a dual faucet kegerator from BeverageFactory.com, Omaha Steaks, a beer club membership, and more! Please help me vote. This contest has a 1 vote per IP address per day limit and only lasts until September 9th. Give it all you've got and help me win another grilling contest!! Share this link of Facebook, Twitter, message boards, etc. or email it to all your buddies! Thanks so much everybody! My recipe, which is also seen below, is the "Grilled Pork Chop with Spicy Peach Chutney." Click on it and it'll show you the recipe... then click on the vote button and you'll cast your ballot for me. Come back daily until September 9th to vote again! Pour 2 bottles of beer into a grill-safe pot. Heat the beer until simmering or slowly boiling. Add 1 and 1/2 cups of brown sugar, 1 Tbsp of allspice, 2 tbsp of cinnamon, 2 tbsp salt and 2 tbsp ground black pepper. Heat keep over heat until all ingredients have dissolved into the beer and come together as one. Remove from heat and chill. Step 3: Make spicy peach chutney. Once the pork is getting close to coming out of the brine, finely chop the shallots, jalapenos, garlic and peaches. Melt some butter in a pan over the grill. saute the shallots in the butter. Once soft, add in the jalapenos and garlic. Saute until cooked down and soft, then add the chopped peaches. Continue to cook down. Add about half of a beer (drink the other half), the 1/2 cup of brown sugar that remains, and salt and pepper to taste. Continue to cook it down while moving on to step 4. I have made this with Bayou Teche Brewing Company's Grenade, which is a Louisiana Passionfruit beer. I suggest something with some fruit characteristics but nothing overly sweet. Pork and fruit work really well together, and a lot can mix with peach, so perhaps a raspberry beer, strawberry beer, or even a pumpkin spiced beer could work. Thanks a great point, Mike! Two votes per day people! !